The Aquatube is machined from a massive piece of Delrin and therefore extremely rugged. The Delrinh white version has four additional holes in the bottom which can house 5mm LEDs, Due to the translucence of the material spectacular lighting effects can be acheived. For the use of this option we recommend the use of our ready-2-use LEDs as well as the Multi-Color lighting module (Aquaero). All connection threads are machined as G1/4", the reservoir has three threads in the bottom and two in the side. Therefore the offered lighting modules as well as tubemeter and aquajet are NOT compatible with this special series. Dimensions: d=79mm l=70mm, V=160 cm³. 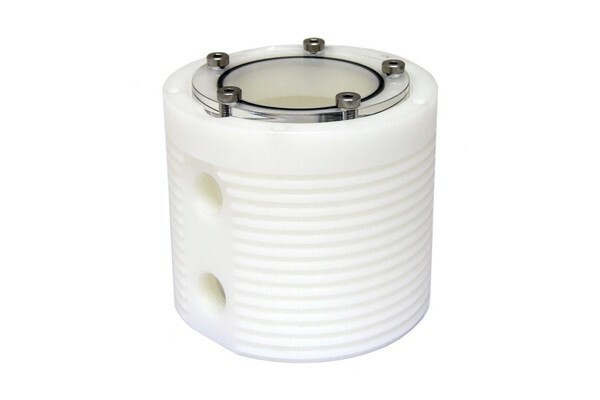 Please note: The reservoir is shipped without fittings, please order the desired fitting separately. The connection threads are G1/4" in size. Nabendallerseits, ich möchte mir eine schicke Halterung für den Ausgleichsbehälter bauen, gibt es vielleicht ein Datenblatt/Zeichnung mit den genauen Maßen der Befestigungs-, LED- und Anschlußbohrungen auf der Rückseite des Teils? Ich möchte ungern auf selbst gemessenen (a la "wer misst misst Mist ") Daten konstruieren ..
Tut uns leid, uns liegen keine Daten Seitens Aquacomputer dafür vor.